Youth sports are a great activity for kids, not just for physical fitness, but also for mental growth. It is important to keep in mind that the benefits of youth sports are the learning opportunities on the path to adulthood, rather than the opportunities of on-field success. As a high school soccer coach, and a life-long athlete, I have been around sports for a long time, and seen all sides of the game. I’ve seen how parents can affect sports for kids, and what sports can teach kids. Personally, much of what I have learned on my way to becoming a young adult has come through sports. If handled properly, youth sports can be a fantastic way for kids to develop and learn. Values such as dedication, commitment, teamwork, and respect, are just a few examples of what kids can take away from sports. Another important aspect of sports is failing. Failure is a great learning experience, and sports are one of the few areas of life where failure is prominent. Whether it is an individual disappointment, like striking out, or it is a group failure like a loss, it is important to have these moments. Sports teaches children that things don’t always go their way, and these moments can encourage one to improve and avoid future failure and disappointment. I had a hockey coach who would praise us for falling over while we were practicing skating, because it showed we were pushing our limits and trying to improve. Parents can also have negative impacts on youth sports for their children, and for teams. I have learned what type of parent I don’t want to become through seeing the actions of some parents on the sidelines of games. When I hear parents screaming at officials, or constantly shouting their child’s name during sporting contests, or even yelling “shoot!” regardless of the situation, it makes me realize that we can get too carried away with winning and losing in youth sports. Observing these types of behaviors is a reality check for me as a coach, and a human. It can get to the point where we take the fun out of the game and turn it into something it’s not. That’s not to say that parents are the only ones that can get too carried away and competitive, it happens more frequently with players. Whether it’s playing dirty, or treating the referee or their coach with disrespect, bad behavior is a common part of the game. In a coaching class I took at the University of New Hampshire a few years ago, Rainer Martens, the author of our textbook- Successful Coaching, made a case for parents not going to every one of their children’s sporting events, especially at a younger age to make their kids know that sports are not the most important thing in the lives of either the parents, or the kids. While I don’t think that this necessarily has to be a step taken to teach this to kids, I think it brings up a good point that maybe parents do give the wrong impression to their children without trying to. I remember a teammate on a Little League team who got stressed out and thought he couldn’t hit when his dad was there, so his dad would watch from afar. I don’t know whether this was because the father put pressure on his son to perform, or it was a perception that his son had, but either way, that doesn’t sound like a positive situation for a 5thgrader in Little League. 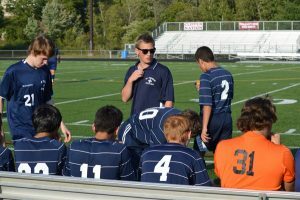 I am all for winning, and I am a very competitive person when it comes to sports, but as a JV boys soccer coach, I have found that sometimes I get more upset with a loss than the players do. Wins and losses shouldn’t matter in youth sports, but progress, and learning on and off the field should. Kids will remember games that they lost, just like they remember games that they won, but the emotion felt about the game is gone not long after the final whistle, win or lose. After my first season, the team had a mediocre record. Despite this, I heard from parents only positive things about their son’s reaction to the season, and their improvement as players. To me, that was the most rewarding thing at the end of it all, hearing feedback about happy players who felt that they had improved.